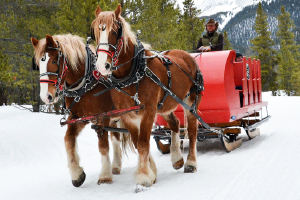 An evening sleigh ride through the Colorado backcountry awaits you at Golden Horseshoe Tours. Take a drive up the Swan River Valley on Tiger Road outside of Breckenridge, to our meeting point for our scenic sleigh rides. The two gentle giants, our Belgian draft horses, are harnessed and ready to pull the cherry-red sleigh that will hold two or twenty. Once you are nestled under your cozy blankets, the driver will guide your sleigh through trails of powdery snow in the White River National Forest. 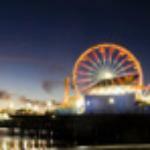 The views are postcard-perfect. With beautiful skies and mountain peak views, a hot cocoa ride is a chance to experience a more leisurely high country winter activity. You may have the sleigh to yourselves, or it may be shared by others looking for a unique ski country experience. Your ride will make a brief stop at the scenic overlook so you can see views of the historic Swan River Valley and imagine the gold mining activity of the past. 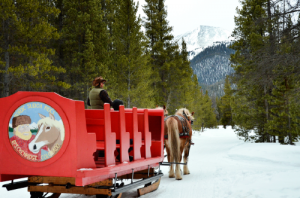 If you can’t join us for our longer Mining Camp Dinner Tour, a scenic sleigh ride is a great alternative and a wonderful memory to add to your Breckenridge vacation. I recently took my family to Breckenridge and thought it would be a great idea to book a sleigh ride. After speaking with Al at Nordic Sleigh Rides, we opted for the ride and dinner combo. What a great decision. I read a ton of reviews of all the sleigh rides in the area before booking. I came to the conclusion that Nordic was the only one we would even consider trying. I am glad we did because it was great. Al, who handles the PR, was very friendly and had a great attitude.